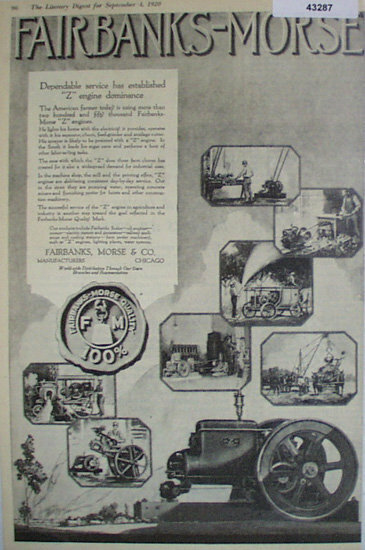 Fairbanks Morse Engines 1920 Ad. This black and white September 4, 1920 ad states Dependable service has established Z engine dominance. The American farmer today is using more than two hundred and fifty thousand Fairbanks Morse Z engines. Picture shows the Fairbanks Morse Z engine and the many machines it is used in. Magazine tear sheet picture is taken through plastic and may show wrinkles or crookedness that is not in the ad. This original magazine tear sheet measures 7 1/4 inches wide by 11 3/4 inches tall. Items Similar To "Fairbanks Morse Engines 1920 Ad"